Apple's new WatchKit software development kit shed some new light on the upcoming wearable's technical makeup, including the physical resolution of the Retina displays as well as the device's support for iOS user interface technologies like Dynamic Type. The 38-millimeter Apple Watch will ship with a 272-pixel-by-340-pixel display, while its larger 42-millimeter sibling is set to come with a 312-pixel-by-390-pixel unit. 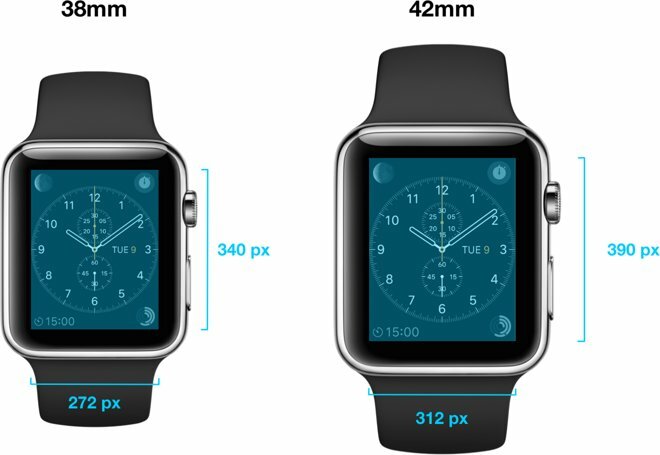 It should be noted that the measurements refer to the Watch's case height, rather than its display size, making the exact pixel density difficult to calculate. The effective pixel density necessary for Apple to designate a screen as a Retina display differs depending on the device's size and the distance at which users typically hold it. The lowest-density display to gain the Retina moniker thus far is the 218-pixels-per-inch screen found in the new 27-inch 5k iMac, while the iPhone 6 Plus's Retina HD display is the highest at 401 pixels-per-inch. Apple also revealed that the bespoke system font on the Apple Watch— called San Francisco— will support iOS Dynamic Type. Dynamic Type adjusts the letter spacing and line height dynamically, depending on the font size selected, in an effort to maintain maximum readability. Developers will still be able to specify their own fonts on the Apple Watch, but they will not be able to take advantage of Dynamic Type if they do so. Many other Apple Watch development paradigms follow those in iOS. For instance, developers will need to submit square icons for the home screen— the Apple Watch will automatically apply a round mask when displaying the icon, much like iOS devices round the corners of icons.